Tours and Safaris offered in Kruger National Park, Soweto, Johannesburg, Pretoria, Lesedi Cultural Village, Elephant and Monkey Sanctuary, Lion Park, Sun City, Lilies Leaf farm, Cradle of Humankind, Blyde River Canyon, Three Rondavels, Bourkes Luck Potholes, Cullinan Diamond Mine, Union Buildings, Voortrekker Museum and many more. We are situated in Krugersdorp, Gauteng, offering tours within all the 9 provinces in South Africa, and cross borderinto Swaziland and the Victoria Falls in Zimbabwe. 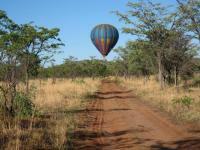 We specialise in cultural and wildlife tours and safaris. These can be tailor-made to suit your individual needs and taste. Why not contact us immediately so that we can assist you in putting together an exciting package suited to your individual requirements. Since 2011, I have been doing tours and transfers within Gauteng Province, Western Cape, North West province, Mpumalanga Province, Limpopo Province, Swaziland, Northern KZN and the battlefields area, as well as Golden Gate. I have worked with the following nationalities: Australian, Indian, Israeli, Dutch, American, Thailand, England, Iranian, Bugarian and Vietnamese.